We know that finding a beach wedding hairstyle can be a challenge as the seaside can ply havoc with your hair. Whether or not it will be windy on your wedding day, you should prepare yourself in choosing a beach wedding hairdo that will look good after the wind and sea spray has been through it. This does by no means dictate that you should pin all your tresses as tightly as possible and use up an entire bottle of hairspray to keep it all in place. A seaside wedding lends itself to more casual hairstyles, and conjures up images of cascading, loose and romantic curls and half up-dos. If you want to wear your hair up then go for a loose, slightly messy look for a casual feel. Even if your ceremony is more serious and formal, your hairstyle (just like your dress) should fit with the more relaxed feel of your beach wedding. 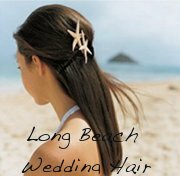 Enhance whatever beach hair style for your wedding you end up choosing with the perfect Beach Inspired Hair Accessories. The right accessories will add that final touch of glam to your overall look for the day and will truly make you shine. You could also think about adding a few fresh flowers (using the same flowers as your bouquet), to decorate your hair in a simple but elegant way. With fresh flowers you really cannot go wrong. They will never go out of fashion. Just make sure you choose flowers that will stay fresh throughout the wedding and not wilt before you have said "I do". If fresh flowers are not an option or too much of a risk, try some great looking silk flowers. 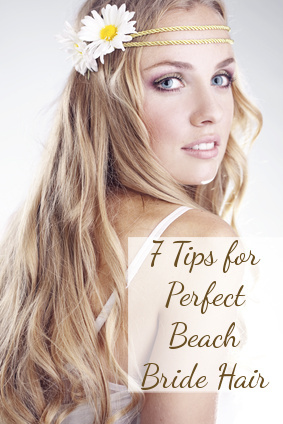 Another great trend is to incorporate a Beach Wedding Headband, into your look. These can be handmade by you from various materials, or buy them made from shells, metal or beading and crystals. Even just a lovely piece of lace looks amazing and it keeps any flyaway hairs in place in case it is a little windy on your wedding day. Seashell or pearl pins or a Beach Wedding Tiara is of course a classic choice for any bride and will certainly make you feel like the princess you are on your wedding day by adding that extra bit of glam. If you are doing your own wedding hairstyle, try to practice it once or twice before the wedding to make sure you have it down pat! If you are having it done by a friend or a hairdresser do the same. Book a trial with your hairdresser and you will be sure that you will look fabulous on your big day. Make sure to look through magazines and even talk to other beach wedding brides in person and on forums to find out what worked for them and what did not. Celebrity Beach Wedding Hairstyles can also be great inspiration.